It occurred to me as I stepped into the Labyrinth that I am at the furthest point away from the centre. If the centre is to represent God, then I was at the furthest point from his love; however I was still in the circle of his love. As I walked I began to get closer and closer to the centre and to God. But with one quick turn I would be walking further away again, and so this pattern went on until I reached the centre. 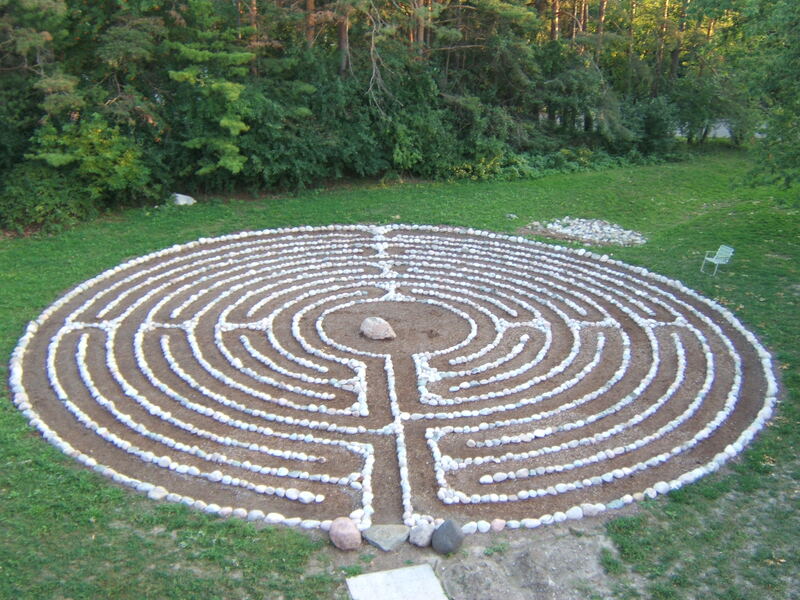 Using the Labyrinth as a metaphor for my life, I can see that there are times when I am able to be close to God and feel his presence (consolation) and then there are other times that it is harder to feel him (disconsolation) – but always knowing that his love is there. God is always in the centre, I’m the one who needs to work at moving toward the centre and to God. The times I feel so rich in his love that I can reach out and touch him are the easy times, when it is easiest to pray. The times when I take God for granted, knowing he is there and feeling his presence, are the times when it is easy to breath. But the harder times are in the outer circles of the labyrinth where I have a difficult time hearing and feeling the love of God. These are the times when it is harder to pray, listen, and be aware of God’s presence. These are the times I may question why, when, what? These are the times I feel I have to work harder to know God’s love because its not God who has taken away his presence but it is I who have not been aware. One particular day I never made it to the centre for some reason. I walked in and around moving from the outside and slowly making my way around the centre. Moving towards God’s love and being one circle away, I was so close, then as I was near the closest point I began to walk out again, feeling that love starting to dissolve. I walked out and sat at on the rock and began to pray – pray for understanding and his love to wash over me. At that point I knew that whereever I am in the circle I am near God I just need to call and He will be there for me to comfort me, to love me, and to help understand Him.